While Industrial Ethernet has become the kingpin and standard for automation control networks, some devices such as smart sensors and actuators are relying on a simpler, point-to-point communications protocol to save on the cost, size, and complexity that an Ethernet solution requires. One increasing popular alternative is IO-Link technology because it can provide a fieldbus-neutral means of bringing information from intelligent sensors and actuators onto Industrial Ethernet networks. The technology creates an effective strategy, especially for configuring intelligent devices on the network, simplifying setup, reporting of diagnostic information, streamlining product changeovers, and also provides an ability to proactively collect maintenance data. The technology is supported worldwide by a consortium of automation control suppliers such as Siemens, Rockwell Automation, Beckhoff, Schneider Electric, plus a large number of sensor, actuator, and other component suppliers. It is particularly popular in Europe, although it is also gaining acceptance worldwide. Click here to listen to a Design News Webcast on this topic. Types of distributed modular I/O slave devices that have implemented IO-Link communications include specialty sensors for measurement, position and color detection, valve manifold control, and industrial RFID processors and heads. 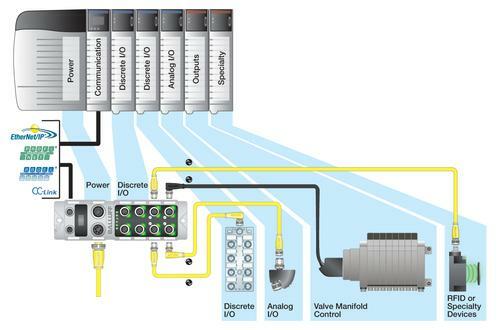 The key to IO-Link is that it offers a point-to-point communication topology (it’s not a fieldbus), which allows users to configure a sensor, perform diagnostics, and receive process data. Users can retrieve distance information, for example, such as the distance from a sensor to an object for positioning purposes or to measure the dimensions of a carton, pallet, or box. Because the technology is fieldbus-neutral, there are masters available to connect IO-Link to all of the major fieldbuses and industrial Ethernet networks. In low-cost systems, the problem with using Ethernet to connect directly with smart sensors or actuators can be the amount of overhead required. Plus, cost can certainly be a major issue because IO-Link communication is much simpler and less expensive to implement. But even if Ethernet is cheap enough, putting an RJ45 connector on a proximity switch and an Ethernet controller inside can be impractical from both a physical footprint standpoint and also the overhead standpoint. IO-Link is beneficial for use in smart sensors because it eliminates the cost issue while every Ethernet drop, IP address, and the total number of connections adds expense. One benefit is the ability to use IO-Link as a kind of expansion technology, which enables customers to basically do more with their Ethernet drops. Whether it’s EtherNet/IP, Profinet, or other popular fieldbuses, adding IO-Link ports on the drop allows a system to branch off and provide easy expandability. If you are interested in learning more about how smart sensors are using this technology as a solution for network communications, automated parameter setting, and more robust diagnostics, view the Design News Webcast that covers this topic.